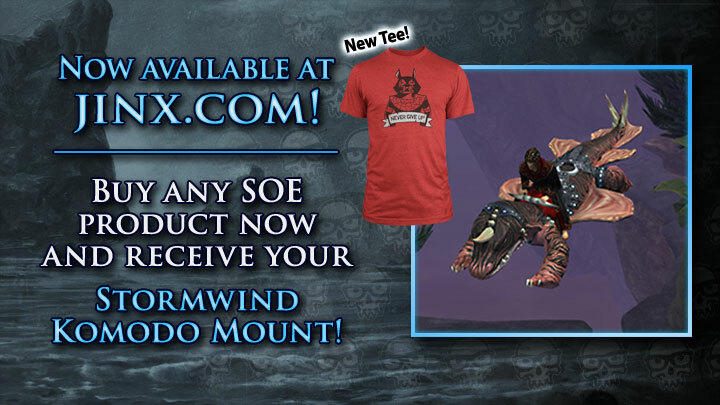 Through December 31st, if you buy a shirt from SOE’s apparel partner J!NX, you will get a bundle of in-game items in EQ, EQ2, Landmark, Planetside 2, and H1Z1 (whenever it launches). Do you love showing your gamer pride? Have you been struggling to find the perfect gift for a fellow gamer? Good news! The Sony Online Entertainment portion of the J!NX store has expanded! Shop now for new shirts from EverQuest, PlanetSide 2, and H1Z1! EverQuest II, EverQuest Next Teams Looking for Coders! Hey guys! Good news! We are going to be hiring more programmers for EQII. We have already made a hire from the community and having people that are passionate about our game working on it is good for everyone! Below you will find links to the job posting on SOE’s webpage. If you have any questions feel free to PM me. 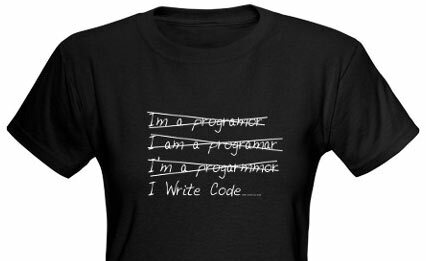 Even if you have not programmed C++ in some time but have a programming background and are passionate about EQII you should apply! Also please include a cover letter that clearly states that you play this game and a little bit about your play style. We hope you are as excited as we are about the arrival of Chains of Eternity, our 9th expansion! CS wants to help you. Below are some common mistakes made and how you can avoid them. AA Slider– Are you 92/320? Make sure your AA slider is set to 0 if you want to start earning towards level 95! Patch New Content – Often Customer Service sees people so excited to start their adventuring they turn in collection quests before the game recognizes they no longer are at cap. 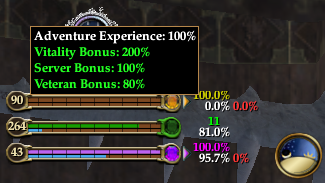 AA Baubles – Chains of Eternity grants 2 AA baubles that will bring you up to 280 AA. These are not one per character, so choose wisely! AA Reset* – Before you jump in and start mass pulling mobs to start leveling, check your AAs. They have been reset and you will need to re-allocate them! For more from CS, visit the Top Known Customer Service Issues thread. Today, November 8th, is officially EverQuest II’s 8th birthday. After the celebrations, long-time players want to know what presents they can expect! 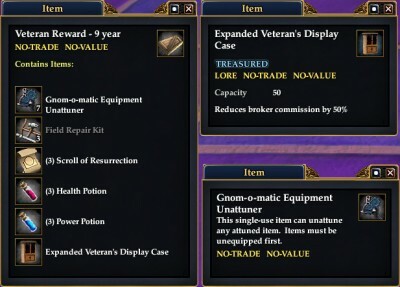 Specifically, they want to know — Will the EQ2 team try to outdo past unique Veteran Rewards? 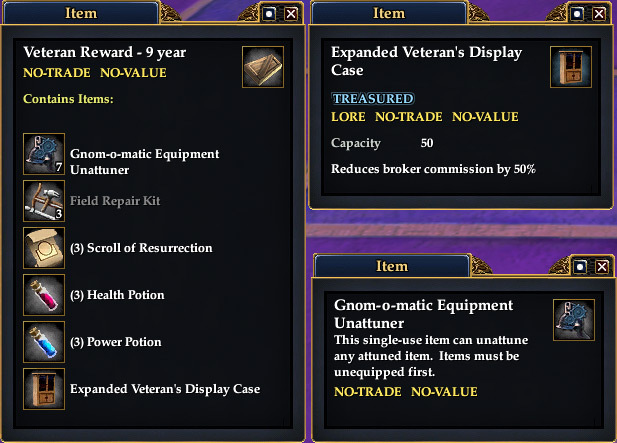 Last year’s 8 year item — Veteran Revival — provided a groupwide resurrect which was a bit slow to cast but has still saved more than a few groups and raids from the jaws of death. Earlier today we talked about Call of the Veteran, or which must be known internally as the “Item From Hell”. It was a unique item, and I use it almost every day, but it does tend to bug out from time-to-time. So you may be wondering why are we talking about a 9 year Veteran Reward when the game is just 8 years old. It so happens that the first four expansions each granted 90 days of additional accrued game time. This practice concluded with the Rise of Kunark, meaning the first four expansions credit one full extra year. So what is it already? Sheesh! As we intimated last month, SOE is finally putting its proprietary forum software out to pasture and moving to modern off-the-shelf forum software — XenForo — which is the creation of ex-vBulletin developers. EverQuest completed their transition to their new forums just prior to their Rain of Fear expansion and now EverQuest II has its own move-in date: November 9th. 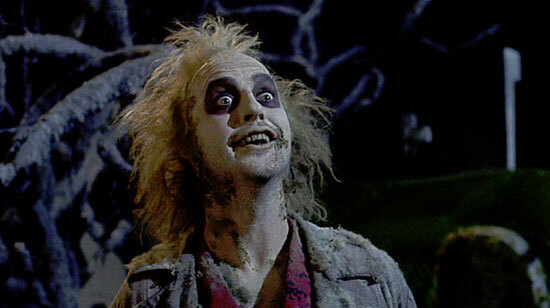 But wait, you’re thinking, November 9th is smack dab in the middle of the Chains of Eternity beta! Well the EQ2 team have thought of that, and will be keeping the CoE beta forums up and running even as the new forums launch. This way the necessary conversions about Beta can continue without holding back the forum transition. I can only guess that November 9th was a date that Platform could commit to, while any closer to the expansion was too risky with everything else going on. Either way, keeping the existing Beta forums up seems a viable compromise. The new forums are long overdue. Vanguard was the first game to have its forum transition announced, and with that news came the reality that all the old posts would only be archived for a limited time. Nor, it turned out, would any existing posts be migrated into the new forum software. The idea of starting from scratch was not appealing to me and so, sensing that the same would happen with EQ2, I spent the weeks leading up to SOE Live writing and testing an “SOE Forum Harvester” script. Even before I went to Vegas, I’d managed to backup some 40% of the EQ2 forums. Krono is live in EQ2! Buy, trade, sell 30 days of Gold Membership time! 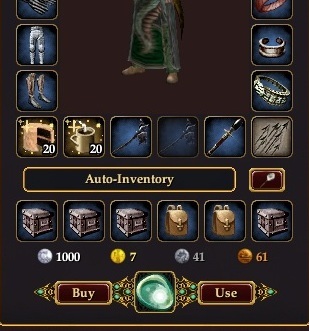 To Buy or Use Krono in game, open your Character’s Equipment panel (“C” is the hotkey) and find the Krono interface at the bottom. For more detail, see http://tinyurl.com/eq2krono. The near universal reaction from players to the addition of Krono to the Character/Persona window has been that the UI elements are far too obtrusive. Left: The new Persona window with large Krono “Buy” and “Use” buttons at the bottom. Right: My mockup for a more subdued Krono interface. Clicking the left arrow would show the BUY screen. Clicking the right arrow would show a window explaining how Krono can be traded, and asking if you want to redeem a Krono for a 30-day Subscription extension. SOE Live is now about 72 hours away and, according to Linda “Brasse” Carlson, the Event Schedule has undergone some last-minute changes. This news would seem to indicate that Wikia sites, at least Planetside 2, will have an official staffer at SOE creating, posting, and presumably editing articles on the Planetside 2 Wiki. It is unclear if this same staffer would be entering data into the EQ2 Wikia (EQ2i). For the most part, the EverQuest II track at SOE Live remains unaffected, and so this does not affect our plans to cover the SOE Live panels as well as participating in both the Data Feeds and Fansite panels. Devoted Arbiter Remnant now has 1 red adornment slot and 1 white slot. Sleeper’s Tomb [challenge] Belts dropped in Final Arbiter encounter should now all have the correct slots. SOEmote is now live on the EQ2 servers and we have reports that players are testing it out, especially in the Sinking Sands and other common zones. 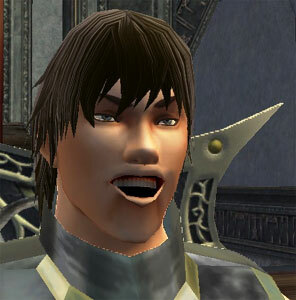 As soon as you login, EQ2 will try to see if you have a Webcam installed and if so, will bring up the SOEmote window with your face on the left and character on the right. You may need to increase the lighting in your room if you have Calibration problems. Some players may experience issues if they wear glasses or have a beard. Starting Wednesday July 18, get 25% OFF when you buy a NEW or UPGRADED multi-month recurring membership! EverQuest, EverQuest II, and DC Universe Online (PC only). If you have an existing recurring membership, this offer is only valid for a new recurring membership with a longer term (e.g., upgrade from a 3-month recurring to a 6-month recurring) or for an upgrade from a single-game recurring membership to an All Access recurring membership. If you have an existing 12-month recurring membership, you may redeem this offer for a new 12-month recurring membership at the discounted price. Promotional pricing will begin on your next billing cycle and will continue until your recurring membership lapses or is canceled. Offer is valid between July 18, 2012 at12:01AM PDT and July, 23 2012 at 11:59PM PDT. EverQuest II has a history of complexity and depth often lacking in other MMOs. Players can be passionate, impatient, forceful, understanding, triumphant, technical, or blasé, sometimes all in the same posting. This can be a double-edged sword for the management of its forum and game communities. We quickly see through attempts to placate, and we can tell when the EQ2 Community Team have not anticipated or prepared for player outrage or confusion over a policy decision. A successful Community Manager is not simply an extension of the Public Relations department. A good CM must act as a liason or ‘man-in-the-middle’ between designers and developers, company management, marketing/PR, and the players or customers. They must play traffic cop, alerting the correct people to issues which are being reported and on the flipside, keeping an ear to the ground for upcoming changes and policies which might stir up dissent. I refuse to accept the idea that “no matter what SOE/EQ2 staff post, players will be unhappy.” This is not only a cop out, but has been proven patently untrue in the past. EverQuest 2 has had a number of popular and/or effective Community Managers that have engaged the community and made players feel that their input matters. Of course EQ2 has also had its share of absentee forum guardians who sought only to maintain order or an air of positivity. The activity level of outlaw forums such as EQ2Flames has directly corresponded to whatever vibe has flowed from EQ2 forum management. Just within my time, the tone has ranged from a prohibition against anything negative, to incredible freedom, to environments which would make Delores Umbridge giggle. Has irreparable damage been done to the trust between EverQuest II’s players and its creators? Is there an opportunity for this damage to be undone? Anything is possible — after all SOE just re-hired Brad McQuaid to continue working on ‘Vanguard’. 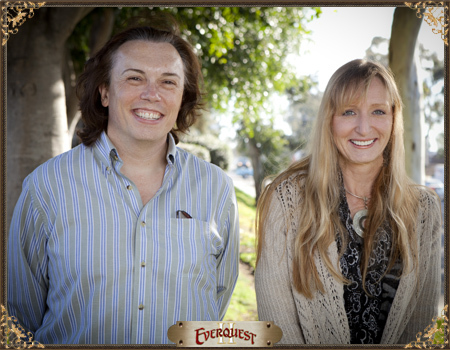 After a few short months at the helm, Eric “Piestro” Cleaver passes the torch to Colette “Dexella” Murphy as EverQuest II’s new Community Manager. When respawning, a player should now be put at the designated entrance set by the dungeon creator. Various issues with the Poet’s Palace Dungeon Maker Map have been fixed. Armor Crates and several other appearance items have been changed from NO TRADE to HEIRLOOM. Sony Online Entertainment (SOE) recently announced a new multi-year partnership with ProSiebenSat.1 Games Group to license eight of its online games in Europe, including DC UniverseTM Online, EverQuest® II, Star Wars®: Clone Wars AdventuresTM, Free Realms®, Magic: The Gathering – Tactics®, Pox Nora®, the upcoming PlanetSide® 2, and the next installment of the EverQuest® franchise. This new partnership will enhance players’ gaming experiences by attracting new audiences into our online worlds (more players = more fun! ), plus will deliver additional dedicated Community and Marketing support, and resources for providing an even more localized experience. We’ve received many questions and comments regarding the new partnership. We sincerely care about our player community and take your feedback seriously. As such, we have put together an updated FAQ that further addresses some of the most common concerns and questions from our online player community. The most recent updates to the FAQ can be found at the bottom of each category. From 12:01 a.m. Tuesday, March 20th, through 11:59 p.m. Wednesday, March 28th, log in to EQII and take part in a look back at Norrathian days of yore. Each month the Community Team will highlight one of SOE’s many diverse employees in a monthly feature titled, “SOE Employee Spotlight.” Each month our spotlighted employee will also appear in some fashion on the Official SOE Podcast. In our February spotlight for 2012 you will meet Carlos Mora, EverQuest II Game Designer. Take a moment to find out about what a typical day in the office is like for him, what his favorite SOE game is, and other fun tidbits. As a special bonus, we included a screenshot from his favorite SOE game for you to download! My name is Carlos Mora and I have worked at SOE for a little over 5 years. Before that I was in the US Military as a computer programmer. Gaming was a huge thing in the military and like just about everyone I worked with I was drawn to EverQuest like a moth to a flame. After my two tours in the military I joined SOE as a member of the Platform QA team working on stuff like the forums, websites, etc. Every day, thousands of game accounts are stolen. Tens of thousands of credit cards are compromised. Most of you know someone who has gone through this traumatic experience. Maybe it has even happened to you. Sony Online Entertainment has joined together with a number of high-profile game companies under the umbrella of the Gamer Safety Alliance to bring you Gamer Safety Week, running from February 6th to 12th, 2012. Our goal is to raise awareness of online security concerns, and to provide some suggestions for our players to keep their accounts safe. These principles apply regardless of whether you sign up for a game, buy some shoes, or donate to a charity online. In this article, we’ll share some actual experiences from our customer service files and how to avoid these nightmares. Over the past year, SOE has redoubled its efforts to continually improve our company’s online security on all levels. Keeping your information safe and secure is one of our top priorities. Even with our evolving security measures, it is still too easy for scammers and hackers to work around all security by counting on the trusting nature of players and the sheer volume of places where information may be shared. Read more at EverQuest2.com, or read the Press Release posted at the Merchant Risk Council. 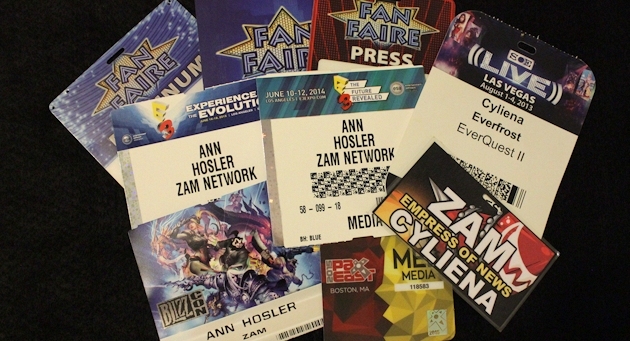 Note: The article makes no mention of the free Mobile Authenticator app announced at Fan Faire. As many of you know, I’m the Executive Producer in charge of the entire EverQuest franchise, including EQ, EQII, and the upcoming (and very different) “EverQuest Next.” For the last two years, I’ve also been the Producer for your EverQuest II world, and it’s been absolutely a blast working with the team, the game, its features, and most of all, its players. However, our company’s visions for the EQ Franchise are bigger in scope than what I can coordinate alone on EQII while also overseeing the rest of the franchise. Could Beastlords Get Insect Warders? Most of the bugs ingame didn’t have very fulls sets of animations, so they wouldn’t work all that well as a warder, but we are working on it. 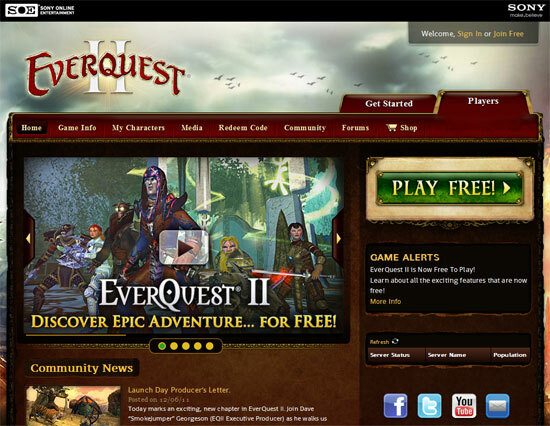 EverQuest2.com has unveiled their new combined EQ2 Free-to-Play website. 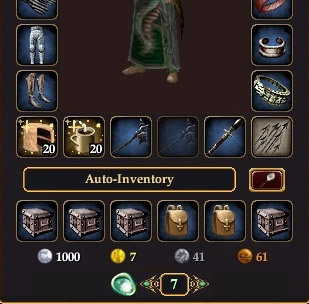 The EQ2Players side which allows players to lookup Characters, Items, and Guilds won’t relaunch until next week.